NIA CHARLESTOWN NEVIS (August 06, 2015) — One of Nevis’ outstanding youth Rol-J Williams of Gingerland, urged other youth of Nevis to get involved in meaningful activities. He said that move could lead them to meaningful recognition and subsequently employment. 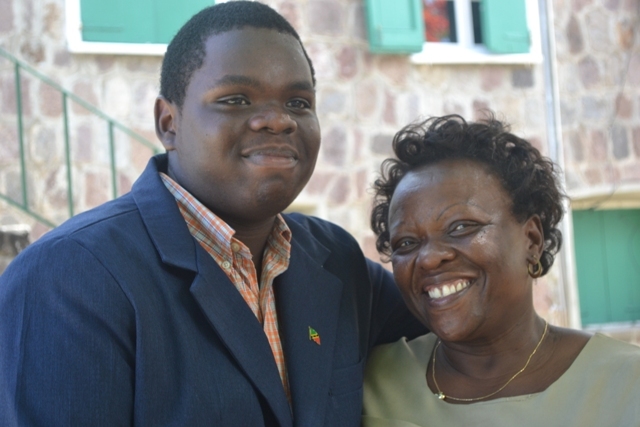 Williams, 15, a Gingerland Secondary School Student and Youth Parliamentarian, made the call when he spoke to the Department of Information on August 05, 2015, moments after he was recognised by the Nevis Island Assembly for his achievement of the Best Orator Award at the recently concluded 40th Caribbean Parliamentary Association’s (CPA) Caribbean, Americas and Atlantic Region’s Conference in Tortola, British Virgin Islands. “From a youth prospective, I would like to implore young people to get involved in meaningful activities because at the end of the day, in order for one to be meaningfully employed and meaningfully recognised, they have to participate in meaningful activities. “I stress meaningful because a lot of the young people are straying and participating in illegal activities and so on to get some source of income and there are other ways in which we can do that. We have training programmes. We have programmes such as the Youth Parliament, the Youth Tourism Congress and I implore young people to get themselves involved in these,” he said. Williams, who has excelled in other areas on the regional and local level, thanked his parents, siblings and extended family for their support. He said his mother Janice Williams has always supported his endeavours and although there were times they had their “little fall outs” he admitted, his loving mother would always return. When questioned about his accomplishments, Williams said 2014 was a good year for him. He said he won the Florida-Caribbean Cruise Association (FCCA) competition at the Youth Tourism Congress and so far for 2015 he had won the local FCCA contest and the most recent was his award at the Youth Parliament. He was also selected to represent St. Kitts and Nevis later this month at a United States Youth Ambassador programme in Vermont. “I feel I have accomplished a lot but I don’t feel it’s enough yet. I’ll continue on my quest for more success and in the coming year I’ll try my best to accomplish more,” he said. Meantime, in invited comments on her son’s achievements Mrs Williams said that he was the youngest of three siblings but at times acted like he was the eldest. She said sometimes she could only laugh when she heard him speak to his older siblings. She described Rol-J as one who always had high expectations, was a leader and not a follower and a self-motivator since he was little and believes her presence and support over the years had helped him to achieve at so young an age. “A lot of times I don’t have to get behind him and a lot of times, I am not ashamed to say, I cannot help him with his work but my presence makes a difference. A lot of times I fall asleep in his bed just being there with him and I know that has done a great deal in his life,” she said. Mrs Williams had some advice for the island’s youth and urged them to follow the examples of her teenage son. “To the other young people out there, I say, motivate yourself. Tell yourself whatever you want to be you can be and just work hard for it. “Rol-J’s achievements continue to make me feel good. It really warms my heart and I know, that is why I encourage other young people to do well because I know how parents can feel, especially with the trend of boys today,” she said.